Today I am going to tell you about my latest purchase and why I believe the share price could double within three years. The company is Tristel (LON: TSTL), a £20m supplier of heavy-duty hospital disinfectants. I’ve been a buyer since December 2013 and my average entry price is 46p. If all goes to plan, my projections suggest the price could trade beyond 100p by 2017. Long-time management and the board’s ‘takeover options’. Tristel is one of the most attractive growth shares I have come across for some time. Floated in 2005, the business only caught my attention in December when an upbeat AGM statement revealed sales up 36% and profits running ahead of expectations. Recent progress has been driven by the firm’s Wipes System, which is based on a unique, patented chlorine-dioxide technology and used to disinfect medical instruments such as endoscopes, catheters and probes. These wipes seem very popular — last year they were used some 1.7 million times in 27 countries and 75% of UK hospitals apparently buy them. As I understand things, the System’s popularity has stemmed from its portability and lower cost. Previously, medical instruments had to be taken away and put in costly machines for disinfecting. 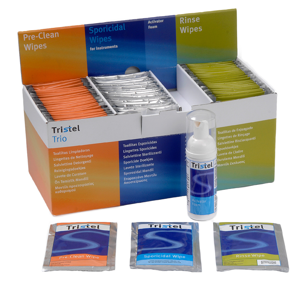 Through Tristel’s Wipes System, the instruments can now be cleaned manually and reused within minutes. The business also supplies disinfectants for veterinary surgeries and contamination-control products for pharmaceutical ‘clean rooms’. The company initially expanded well following its 2005 flotation, with profits lifted every year until 2011. At that point, extra investment in ‘clean room’ facilities and overseas operations knocked earnings and the dividend. The haphazard performance then continued into 2012 and 2013, as demand for certain legacy products collapsed and a contract manufacturing agreement was terminated suddenly. Nonetheless, the very latest results show Tristel returning to health. After that aforementioned AGM statement in December, a trading update during January then revealed a further performance upgrade. Interim results earlier this month then confirmed sales had surged 46%, a prior loss had been transformed into a pre-tax profit of £0.7m, as well as a quadrupled dividend. Progress was spearheaded by the Wipes System and similar products, which improved sales by 86% in the UK and 40% overseas. At the last count, the balance sheet carried cash of £1.6m, debt of less than £0.1m and no pension complications. Cash flow looks reasonable, too. I’m pleased working-capital movements started to move in the right direction during 2013 and continued in the same manner within the H1 results issued in March. In addition, I see capital expenditure on tangible items has been broadly matched by the depreciation charge levied against headline profits. And although cash spent on intangibles has exceeded the associated amortisation charges by some distance, such expenditure has been associated with ‘one off’ expansionary projects and do not appear ongoing. Emphasising the current cash generative position of the business, Tristel management disclosed at the H1 results presentation that cash at the end of February was £2m (that is, a £0.4m improvement on the end-December position showed in the H1 results). Chief executive Paul Swinney has led Tristel throughout its quoted history. True, he has to take responsibility for the group’s setbacks, but at least he’s shown commendable loyalty to the business — he’s been in charge since the firm was established in the 1990s. Mr Swinney’s basic pay does not look extravagant at £143k and remains at a level similar to that seen four years ago. Bonuses have been modest, when paid, and his shareholding is a respectable £400k-plus. I can’t recall ever seeing such an exercise condition before — and I feel it may tell us something about what eventually could happen to this business! (The finance director has recently been issued with similar options at the same 65p price). Just so you know, the non-execs here collectively have more than £6m riding on the share price, giving the board as whole 34% control of the business. I like that alignment with ordinary investors. My assumptions are based on management comments at the H1 presentation, which disclosed an internal sales growth target of 17% a year for three years, and ambitions to raise pre-tax margins to 15%. Sales for 2013 were £10.6m, so 17% annual growth for three years would give sales of £17m. Then applying margins of 15% and standard tax at 20%, I come to earnings of £2m or about 5.1p per share. Mix in a P/E rating of 20 — quite fair I feel for a business that would have shown organic 17% sales growth for three years — and my target price for 2017 comes to 101p. Are those projections too optimistic? …and you also consider 72% of recent sales were from patent-protected products, then perhaps it makes sense to become a little ambitious with the estimates and prospective rating. Bear in mind, too, that I have not accounted for the cash pile, which at a reputed £2m currently represents 10% of the present market cap and should increase over time. Dealing with a powerful customer: One customer (I assume the NHS buying agency) represents about 20% of current sales and could cause some trouble if it decides to play hardball. I have sadly seen many quoted small-caps become croppers over time after the UK Health Service has decided to switch tack or defer projects. Paying up for growth: The shares are not an obvious bargain on current measures. Doubling the March H1 figures gives EPS of 2p and a P/E of 25. Also, the trailing yield is less than 2%. If my sums are too rosy, the downside could be considerable. Further mishaps: Tristel has a blemished history and I do wonder if the same management will endure more setbacks. But I’m hopeful the business has now become settled and growth from here will be steady and organic. As I say, Tristel is one of the most attractive growth shares I have come across for some time. The Wipes System is a simple, repeat-use market-leader and — when you think about medical instruments, clinical procedures and the pathogenic diseases being broadly the same around the world — the long-term international growth prospects could be immense. Plus, with 72% of sales patent protected, alongside the decent accounts, confident management and the share-price upside possibilities, I foresee superior returns during the next three years. This entry was posted in My Shares, Tristel and tagged Tristel, TSTL on March 20, 2014 by Maynard Paton.